RESULTS: Ignore the diagonally running prominent metal water pipe on the left. Kris’s survey team has completed an extension southwards and eastwards of the survey done in 2003-2006 by Prof. Mark Noel of the University of Durham, during our excavation of the Roman temple hoard site, with excellent results. 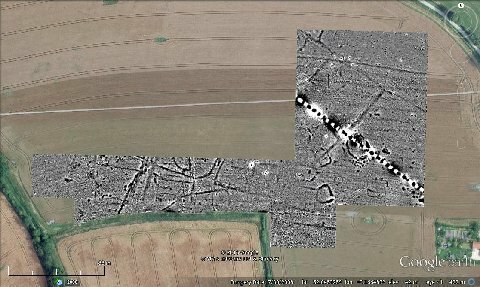 The new area reveals more Late Iron Age pits, ditched enclosures, likely building sites, droveways, and small fields. Kris plans to return to the site in the coming weeks and months to survey more in the same and neighbouring fields. Many thanks to Kris and Ellen, NHAS members, Brian, Graeme and Sarah, and Sarah’s Ashwell Archaeology Group volunteers, as well as the volunteers from other local societies. hertsgeosurvey www.hertsgeosurvey.wordpress.com/author/hertsgeosurvey/ for results and blogs from Ashwell, Verulamium Park (spectacular), Braughing, etc. 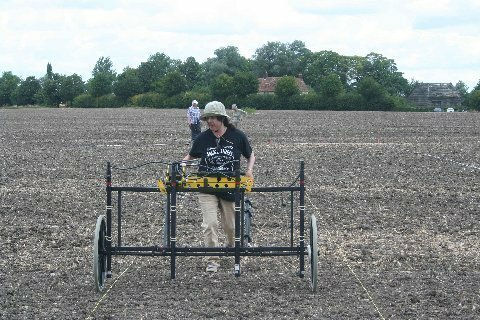 Saturday 24th August, 2pm: NHAS members are kindly invited by the Norton Community Archaeology Group to the open day at this year’s dig on the increasingly interesting and important Neolithic Henge at Norton where evidence for three pre-henge Neolithic buildings has been uncovered. Guided tours by the site director, Keith Fitzpatrick-Matthews. See attachment. A fun packed programme of music and medieval mayhem. This summer’s Magna Carta events are inspired by the 800th anniversary of St Alban’s unique place in the history of the Magna Carta. Saturday 14th, 1pm to midnight & Sunday 15th September, 1pm to 5pm: Caldecote 11th century Church near Ashwell – Open Days with live classical and jazz music and cream teas. To raise funds for the repair of the tower. See attached poster. PLEASE SEE EXCITING ANNOUNCEMENT ATTACHED! COME ALONG – AND BRING YOUR FRIENDS! If you are unable to come, a donation to Caldecote Church Friends for the ‘Tower Roof Fund’ will be welcomed! See also attached details of our latest booklet. Information kindly sent by Keith Fitzpatrick-Matthews. wondering whether that would be of interest to you or your followers. The speaker is Paul Roberts, a Senior curator in the British Museum, Department of Greece and Rome, and is head of the Roman collections. He is the organiser and arranger of the current exhibition, ‘Life and Death in Pompeii and Herculaneum’ at the British Museum, see below. Paul’s particular research interests include Roman glass, pottery and bronze, trade, Pompeii and Herculaneum and the mummy portraits of Roman Egypt. More broadly he is interested in the Roman Mediterranean and has taken part in excavations in Greece, Libya and Turkey. He has excavated widely in Italy and is particularly interested in the history and archaeology of Rome, the Bay of Naples and Sicily. Currently he has prepared a major exhibition on daily life in Pompeii and Herculaneum being held in the British Museum until 29th September 2013. Paul studied at Cambridge University, then lived and studied in Italy for six years before returning to studies at the Universities of Sheffield and Oxford. He joined the British Museum in January 1994. There is ample parking around the college which is free and the event itself is free of charge. If your members are interested please could they book online for a ticket, so we know how many numbers we are expecting. Thursday 24th October, 8pm: Professor Mike Parker Peason, University College, London, Institute of Archaeology, will give a lecture on ‘Prehistoric Henges’ at the Spirella Ballroom, Letchworth Garden City. Organised by Norton Community Archaeology Group. Egyptology, Aztecs, Ancient History, Anthropology, Incas, Greeks, Romans, Chinese, etc. HOORAY! We’ve done it. The Lifers’ Club has reached its minimum target and will now certainly be published. In the meantime I and those clever folks at Unbound have got several things to do: designing, editing and producing the book. To find out what we’re all up to you can visit my Shed at the Unbound website (and they’re going to teach me how to update it all by myself!!!). All this is going to take time, and while we’re doing it we’ll still be able to enlist any further subscribers here. If you’d like to increase your current pledge level to include further goodies, then please do so by clicking on the upgrade options, listed below your current pledge level here. All new names will, of course, be listed in the back of the book until we close the subscribers’ list to move onto the next step. I’m now a convert to crowd-funding. Never before have I established such a strong link with my readership as I have with this project – and the book hasn’t even been printed! Later I’ll be appearing at book festivals and book-signings and I VERY much hope we’ll be able to meet in person, if I don’t know you already. I’ll be publishing full contact details in my Shed. 2013/14 Subscriptions became due on 1st June 2013. Please renew now. The Society cannot continue to function without all members’ subscriptions. In particular, lecturers fees and expenses and hall hire have to come from subscriptions. Lack of sufficient income from subscriptions may result in fewer lectures. It’s up to us members. Subscriptions for 2014/15 onwards were raised by a vote at the AGM last May.